This is a hop for folks who love the outdoors. Please link back to Maple Hill 101. It's been a dreary winter here so far. the sun has been hiding around these parts. with blue as far as the eye could see. We appreciate things so much more when we are denied them for a time. This weekend found me fertilizing all of our crops. It was so good to get outside and see what is growing in our modest garden. we have a broccoli forest started. and create a lusher look. that will supply us with a red pepper regalia. and hope to be harvesting within the next two months. This is the Epic variety which can be found here. We have a couple that will be ready a little sooner. is in Mimi's Ratatouille or roasted for a delicious pizza topping. We're also growing this striped variety, Listada De Gandia. The seeds came from here. I'm still having to reseed beets and sugar snap peas every few weeks. as I thought by now we'd be swimming in peas. so I'm chalking it up to that. that's planted with two types of lettuce, beets and parsley. It's the only place in the garden so far that has produced beets. Maybe there's something to this container gardening, huh? as well as a few broccoli plants that Lynn had left over. that are just getting started. Thyme makes its home in the center of the bed. A few lettuce starts were added along one of the paths in the south bed. The arrow toward the upper left corner shows their location. Our Halloween jack-o-lantern is slowly decomposing in the foreground. 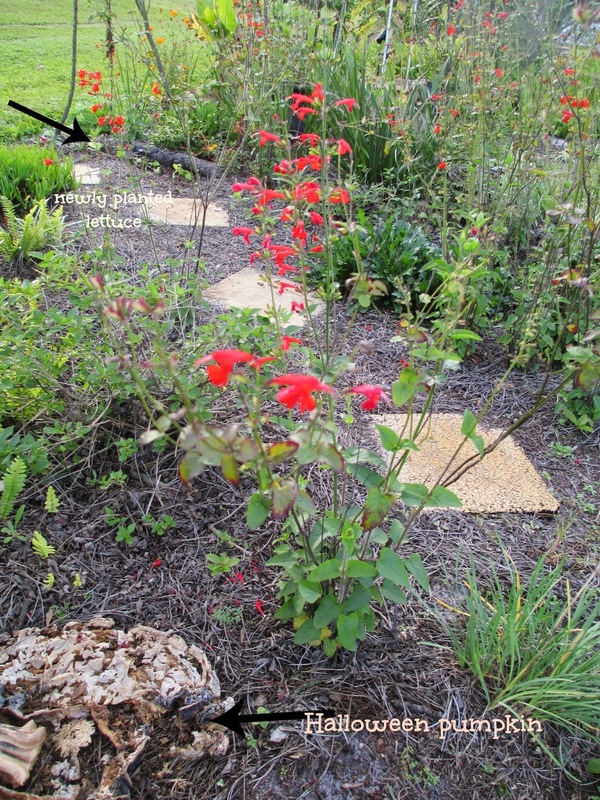 The red flowers are native salvia, in case you're wondering. and the bees love 'em too! The butterfly garden is making a comeback. sharing space to greet flying visitors who bless us with their presence. Everywhere that parsley has been planted is exploding. and we hope to be loaded with them in a few months. (we give them away when we have them to educate folks on the life cycle). It smells so good, and we're hoping it will do double duty as a mosquito repellent. Without the streaming sun, we've been grateful for any burst of color in the garden. These rudbeckias are still giving us a pop of pizazz. Milkweed pods have been harvested to start new plants. with the necessary plant needed for their own butterfly gardens. Our passionflower vine is blessing us with blooms daily. Another butterfly plant, it adds beauty to the garden year-round. We're so grateful to be able to enjoy so many wonders of nature. And so thankful for that glorious sunshine! What's going on outside where you are? You have so much color going on! Love it!! I'm down to 49 shades of gray---gets a bit drab after awhile but at least my geraniums on the windowsills are starting to rebloom and that's always a welcome burst of color. Have a wonderful time out tending the plants. Thank God for those geraniums! So glad you could stop by and see what we're up to! Oh my goodness, I came back this afternoon to do some reading, and saw I linked the wrong (indoor!) post this morning! I'm so sorry, if I could delete I would! Will you delete it for me? Thanks for hosting, I'm sorry I messed up! No worries, Jennifer. I hope you'll come back to share some outdoor posts! I will! I had a post about our roosters that I meant to share. I must have gotten confused. Mornings are crazy times around here. Daisy, there's not much going on outside here just yet as the ground is frozen solid. We are experiencing temperatures in the 40s and 50s which is not normal for this time of the year in Nebraska. I'm enjoying them but know that February is coming and could bring more extreme temperatures that can go below zero again. The saving grace to all this extreme weather is that seed starting will begin soon. The garden season begins with starting seeds under the grow lights in February. I'm hoping for a much better year than last year. I'm gearing up to have plans for any thing and everything. Whether the weather brings wind, hail, excessive rain, late frosts, or floods, I have a plan. Last year was a real eye opener as to what might have to be endured in the future years. I always so enjoy hearing about the Florida container garden. I too am attempting to grow part of my garden in give gallon buckets. It also have an automatic watering system. I'm still in the perfecting stage. It might be a couple more years before I get it all working together. It's a great concept and I've picked up many tips from you writing about your days at the farm. Have a great outside gardening day. It won't be long before you're planting seeds, Dave! Stay toasty!